Drug cheats robbed Hilary Stellingwerff of her Olympic moment in 2012. The Canadian middle-distance runner hopes that Friday's historic decision by the track and field's world governing body to keep Russia out of this summer's Rio Games, will give her a second chance. 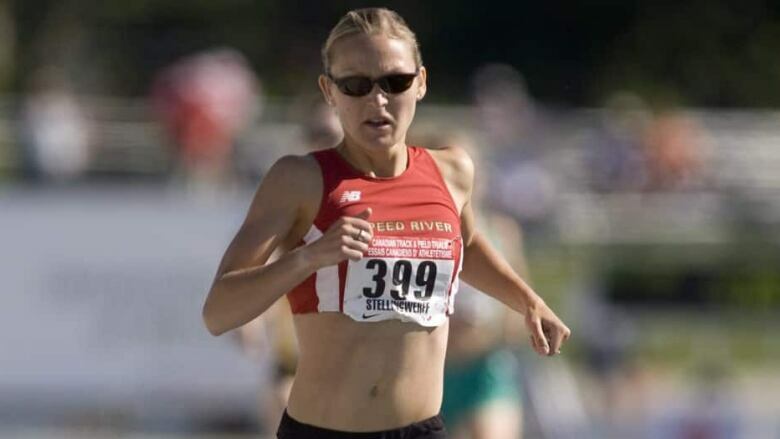 Hilary Stellingwerff is one of seven athletes from the Speed River Track and Field Club competing for Canada in Rio. Drug cheats robbed Hilary Stellingwerff of her Olympic moment in 2012. The Canadian middle-distance runner hopes that Friday's historic decision by the track and field's world governing body to keep Russia out of this summer's Rio Games, will give her a second chance. "To be honest, if it didn't happen, it would cause me to question the value of clean sport to IAAF and I would honestly question even being in Rio if I made it," she said. "What's the point?" The IAAF upheld its ban on Russia's track and field team in Friday's decision that punishes the world power for systematic doping. Stellingwerff missed the women's 1,500-metre final at the London Olympics by just one spot. Since then, six of the 12 finalists — including two Russians and Turkish gold medallist Ash Cakir Alptekin — received doping bans. "I hope I get the opportunity to compete in Rio, with clean athletes and with Russia banned, so that I can kind of do a re-do," said Stellingwerff, who still has to qualify at the July 6-10 Olympic trials. "I know it doesn't make up for 2012, but it would help that the sport is moving forward in the right direction." Iñaki Gomez, an Olympic race walker and the athlete director for Athletics Canada, applauded the IAAF's decision. "On a personal basis, I'm happy and on a representative basis, I applaud the decision," Gomez told CBCSports.ca on Friday. "I think it's the right steps to take and the right decision given the circumstance. I think it upholds the integrity of the sport as well as championing the whole spirit of clean sport." Gomez is the male athlete representative for the national organization along with female rep Jillian Drouin. He contributed to Athletics Canada's open letter to IAAF president Sebastian Coe as well as a statement from the athlete council in January. "I'm glad that Athletics Canada can be viewed as a championing organization that recognizes the need to voice the athlete's opinion and not just their own," Gomez said. Canadian race walker Evan Dunfee said it was "poignant" that Australia's Jared Tallent received his Olympic gold medal in the 50-kilometre race walk on Thursday, four years after losing out to a Russian drug cheat. "This decision today goes a long way in ensuring that we don't have to right the same wrongs four years from now," Dunfee said. "Russia is clearly not the only doping problem country for the IAAF, and nor is athletics the only doping problem for Russia, and I think this stands to show what can happen when a thorough, independent investigation is carried out." Dunfee added that "clean athletes can rejoice" at the decision. "For me personally, this means that I can stand on the start line in Rio with a much cleaner field and much greater confidence in chasing my lifelong dream of standing on that Olympic podium." Brianne Theisen-Eaton, a silver medallist at the world championship in heptathlon, thinks the ban is good news. "I honestly found it kind of sad that one Russian athlete made the statement: 'How are we supposed to win without doping?' I'm so thankful to be from a country that believes in our talent just as natural athletes and not feeding us this crap that you have to dope to win," Theisen-Eaton said. "I find that extremely sad." Meanwhile, the chairs of the IOC Athlete Commission and the WADA Athlete Committee said they "commend and support" the move. IOC athlete chair Claudia Bokel and WADA athlete chair Beckie Scott, a Canadian cross-country skier who belatedly received a gold medal after drug cheats were stripped of their results at the 2002 Olympics, say they will "hold this decision as symbolic that the voices of the clean athletes have been heard." "We recognize that this decision is only one step in the process of ensuring that the Rio Olympic Games will have a level playing field," Bokel and Scott said in a release. "But, we are heartened to see that the facts as presented by WADA and the IAAF task force have been considered thoroughly, and that the evidence has lead the IAAF to make decisions based on integrity — maintaining clean sport as a central policy." They added that they speak for athletes globally who want to ensure that the Olympics remain a place where politics does not trump principle. "I think that clean athletes going to Rio can be really encouraged and heartened by the decision and what the position taken by the IAAF was today," Scott said on a conference call. "There was no question about the stance that they took and the principles upon which they based their decision. I think this is a really monumental, historic day in many ways for clean athletes and for clean, fair sport. "We really commend the IAAF for siding on what we feel is the right side of sport." The Canadian Olympic Committee also supported the decision. "This (world anti-doping) code is in place to protect clean athletes and provide them with a fair and safe sporting environment," COC president Tricia Smith said in a release. "Athletes who violate the code and nations that institute systemic doping must face sanctions and the consequences of their actions."